The United States Congress designated the Leaf Wilderness (map) in 1984 and it now has a total of 993 acres. All of this wilderness is located in Mississippi and is managed by the Forest Service. South Mississippi's tiny Leaf Wilderness lies almost entirely on the floodplain of the east-flowing Leaf River, just north of Black Creek Wilderness. Except for a little western upland, the entire Wilderness consists of meandering sloughs, oxbow lakes, and level terrain of spruce-pine forest or oak-gum-cypress river bottom. 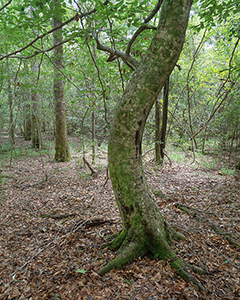 Loblolly and shortleaf pines shade the upland, with a dense understory of dogwood, redbud, persimmon, blueberries, and honeysuckle. The only threatening shrub is poison oak, which always seems to find a way to make contact with exposed skin. The 1.5 mile Leaf Trail, one of two main attractions in the area, crosses the Wilderness and three bridges and a boardwalk to access this piece of Mississippi, where camping is unrestricted. The other attraction is wildlife, including white-tailed deer and wild turkeys, which bring in hunters during the fall months. Planning to Visit the Leaf Wilderness? How to follow the seven standard Leave No Trace principles differs in different parts of the country (desert vs. Rocky Mountains). Click on any of the principles listed below to learn more about how they apply in the Leaf Wilderness.